On this, the opening weekend of this year's NFL season, studios have decided to go after that woefully under-served market, guys who like action movies. The western used to be a tough guy actor's staple before falling out of favor in the 1980s, and returning only sporadically. Either tastes changed or actors started being less manly – I can't say for certain which was true, but spandex suddenly became popular around that time, so you be the judge. Although few original westerns are still made these days, Hollywood's penchant for remakes isn't leaving this genre behind. 3:10 to Yuma revisits the 1957 Glenn Ford film of the same name (and based on an Elmore Leonard story). 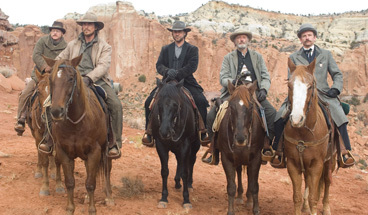 Russell Crowe and Christian Bale star in the remake as an outlaw and an ordinary man tasked to bring him to justice, in the form of the 3:10 train to Yuma, respectively. As Crowe's outlaw buddies attempt to spring him, it becomes a battle of wills between the two men, with the "Quien es mas macho?" title at stake. Yuma is positioning itself as a gritty, throwback style western, updating just the filming and acting styles while keeping the themes and gunfights intact. Early reviews have praised the film's kinetic style, along with the possible Oscar-ready performances of Crowe and Bale. The question that remains is if audiences are ready to re-embrace the genre, and are these the stars to make them? Crowe has gone through a bit of a dry spot at the box office lately, with both Cinderella Man and A Good Year disappointing, while Bale has rocketed to...recognition while playing Bruce Wayne in the revitalized Batman franchise. Neither are huge leading men in recent history, though both are well-respected actors who lend credibility to the film. This may be enough to inspire audiences to test out the relative novelty of the western, and in about 2,600 venues, this should see a weekend of $14 million.